It’s been a long day! I’ll start with the end … my faithful volunteer and best friend met me at school after a day of meetings … he put up my curtains for me! This pic is not all that great … but the result is awesome! 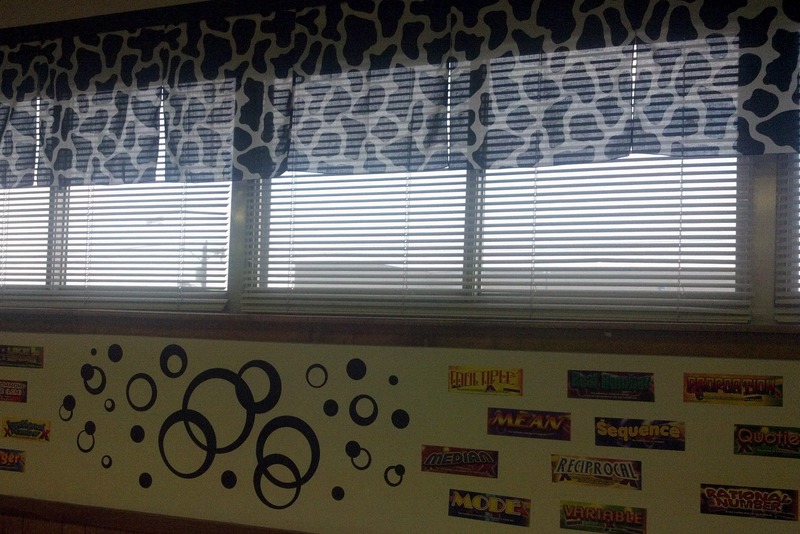 The classroom environment is coming together! My first day of new teacher orientation was good! I felt a little self-conscious at times about my age and experience. The rooms were filled with teachers (about 350 of them) many of whom could have been my sons and daughters. Not every session was engaging but I did learn good information about this new district. We discussed effective practices contrasting them with unacceptable ones. We reviewed the seven principles in Robyn Jackson’s book, Never Work Harder Than Your Students and Other Principles of Great Teaching. IT specialists helped us get online, get our email set up, and showed us some great resources! I saw several short clips of inspiring videos … my favorite was about the Panyee Soccer Club. I am enjoying this new adventure before me! This entry was posted in Gratitude, Math at School and tagged adventure, classroom, environment, new beginnings. Bookmark the permalink.